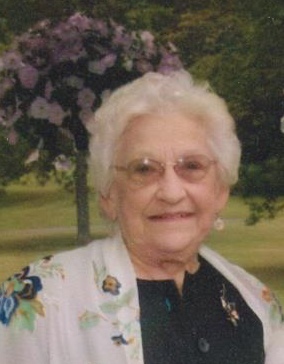 FULTON, NY – Jane A. Heretyk, 91, of Fulton, died peacefully Thursday evening April 13, 2017, with her family at her side. She was born in Oswego, the daughter of the late John and Rozalia (Kaczowka) Rodak. Mrs. Heretyk had been a resident of Fulton since 1948. She was a 1999 graduate of SUNY Oswego, earning her BA degree in Russian Studies, where she was the recipient of the Dr. Susan Fines Award for Excellence in Russian Language. She studied in Russia and Italy, and loved to travel. She loved spending time with her children, grandchildren, and great-grandchildren, especially at Christmas. Mrs. Heretyk was predeceased by her husband, Walter Heretyk, in 1985. She is survived by her loving children, Joan (Michael) Foster of Baldwinsville, John (Wendy) Heretyk of Oswego Town, Shelley (Naresh) Garg of Long Valley, NJ, and Nancy (Richard) Abel of Amherst, NY. She is also survived by her beloved grandchildren, Katherine (Phillip) Parrish, Jennifer (Thomas) Fisher, Matthew (Katherine) Foster, Jane (Nicholas) Provoncha, and Kevin Abel; three great-grandchildren; her sister, Helen Bressler of Oswego; and several nieces and nephews. In addition, she was predeceased by her siblings, John, Anna, Paul, Walter and Joseph. Funeral services will be Tuesday at 10 a.m. in Our Lady of Perpetual Help Church, Minetto, where a Mass of Christian Burial will be celebrated. Burial will be St. Mary’s Cemetery, Fulton. Calling hours will be Monday 4 – 6 p.m. at the Sugar Funeral Home, 224 W. Second. St. S., Fulton. In lieu of flowers, contributions may be made to the modern languages at Oswego College Foundation Inc. 215 Sheldon Hall, Oswego, NY 13126. Jane was in my class in Russian Level One, first semester, and I remember she was a dedicated student. As one of several ‘non-trads’ we sort of hung out together before class (in the old Rich Hall hallway), and sometimes even went out to lunch in the old Rathskeller in Hewitt Union. Seems like a long time ago, but Jane was already retired and I believe a widow who gravitated to younger people because she wanted to stay young herself. Rest in peace, Jane. Sympathies to her children and grandchildren!